Update Samsung Galaxy S6 Edge To Resurrection Remix Pie (Android 9.0) || RR 7.0 || codenamed zeroltecan: This ROM build is available for Samsung Galaxy S6 Edge. The Custom ROM is shared on Xda by enesuzun2002. If you want to know more about Resurrection Remix Android 9.0 Pie For Samsung Galaxy S6 Edge, just follow the Xda thread here. The Android 9.0 Pie is fairly a new version of the Google labs. With the release of new Android 9.0 Pie, the parallel thing that happens is the development of the Custom ROM which essentially acts as a wrapper to the underlying Android version. 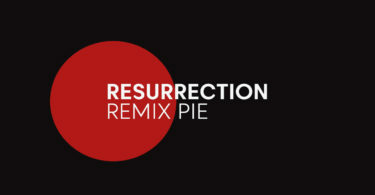 The Official Resurrection RemixExtended Pie on Samsung Galaxy S6 Edge based on Android 9.0 Pie is packed with new Wallpaper Themes, AutoFill, Redesigned Power Menu, Adaptive Icons, Picture -In- Picture Mode, Google Play Protect and 2X Boot Time, new Shutdown and boot Animation, Pixel 3 Launcher, Round Statusbar Icons, and Settings. Follow the below step by step guide to install Resurrection Remix ROM on Samsung Galaxy S6 Edge (Android 9.0 Pie). The Samsung Galaxy S6 Edge was announced back in March 2015 along with Samsung Galaxy S6. The phone features a large 5.10-inch touchscreen display with a resolution of 1440 pixels by 2560 pixels. It also has an Edge display which makes it unique. The device is powered by an Exynos 1.5GHz octa-core processor coupled with 3GB of RAM and 32GB of internal storage (Non-expandable). The Samsung Galaxy S6 Edge sports a 16-megapixel rear camera and a 5-megapixel front camera. The Samsung Galaxy S6 Edge runs Android 5.0 Lollipop and houses a 25 non-removable battery. Make sure you have taken a backup of your important data. Now proceed To Install Lineage OS 15.1 On Samsung Galaxy S6 Edge.